In brief: I know you won't blame us for ordering in from Kokum today because WTF NEVERENDING WINTER. The excellent dishes from Kokum go a long way to making me feel happier though. 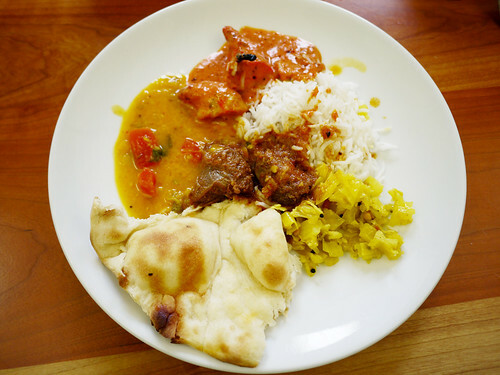 Today we had the chicken tikka masala and the lamb madras, both quite good in their own ways. One of the things I love about Indian food, and who knows if this is even the proper way to eat it (is there a proper way?) is putting little bits of everything on a plate and having all the tastes in there at once.